I don’t miss the days when green was not a popular hair color option. The scarcity of greenheads was partly because of the unavailability of variety when it came to green shades. However, with the color catching on in popularity with other bold unnaturals, hair dye brands have been releasing new shades and I just can’t get enough of this wonderful color! Punk neons, gothic emeralds, and pastel mints – you name it, they’ve got it. 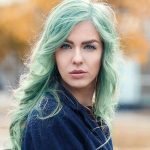 In this article, I’ve put together a list of the best green hair colors. 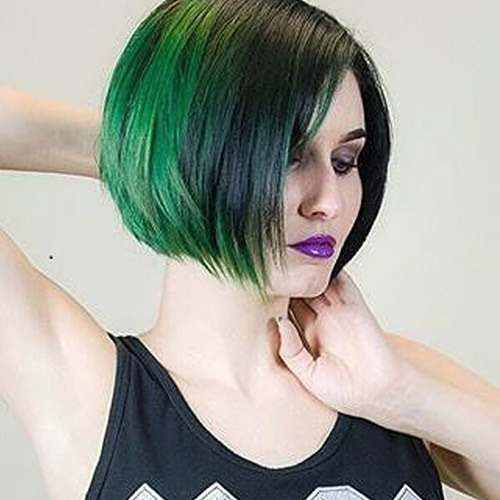 Keep reading to know which brands to keep an eye out for while shopping for green hair dye. 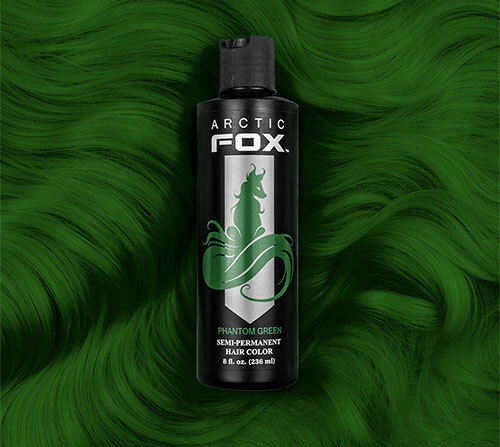 Arctic fox is my personal favorite when it comes to semi-permanent hair colors. Not only are the dyes made from 100% vegan ingredients, without any animal by-products, but 15% of the brand’s profits go towards helping animals in need. The dyes are extremely gentle on your hair and do not contain any harmful chemicals. In fact, they come with added conditioner. The colors are vibrant and long-lasting. Phantom Green, Iris Green, and Neverland. 15% of the brand’s profits go towards preventing animal abuse. Lasts quite long for a semi-permanent hair color. Has a fruity grape fragrance. Does not stain your skin too much. Color does not bleed onto your sheets. A little goes a long way on pre-lightened hair. The best thing about Splat Hair Dye is that it comes as a complete hair coloring kit with bleach, dye, gloves, and instructions. The bleach helps lighten your hair so that the resulting color after the dyeing process is intense and vivid. The brand also does not animal test and uses vegan ingredients. 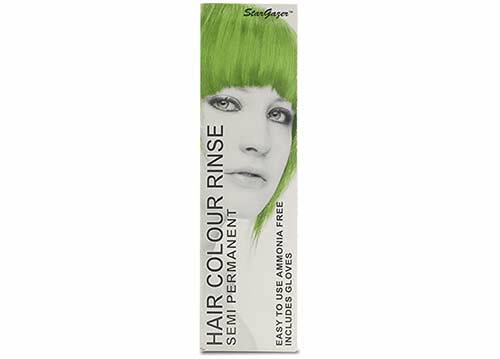 The color lasts for up to 30 washes, making this dye extremely long-lasting. Vegan hair dye. Not tested on animals. The color stays vibrant for about 3 weeks. Fades beautifully on extremely light or pre-bleached hair. The dye bottle comes with a nozzle for easy application. Stains your skin and sink but washes off in a couple of days. The color bleeds in the shower. Needs to be stored in ziplock bags so that it doesn’t dry out. 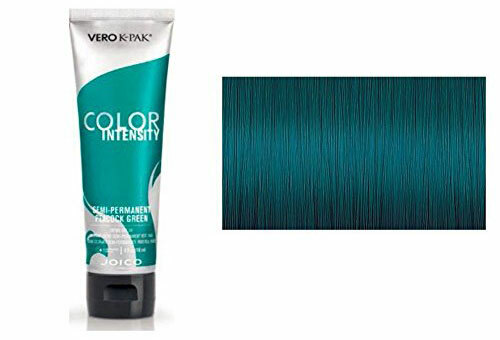 Joico’s Color Intensity range consists of dyes with concentrated pigments. The colors can be mixed to create custom shades or can be used on their own on pre-lightened hair. The dyes are developed with a no-peroxide formula that leaves your hair with vibrant results. The brand claims that the color will last for up to 15 washes. Peacock Green and Kelly Green. Lime Crime is a cult beauty brand that has three shades of green dyes to choose from. 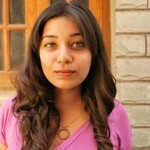 The dyes are specially formulated so that they even show up on light to medium brown hair. The products are 100% vegan, cruelty-free, and also extremely gentle on your hair. The colors don’t take as well to brown hair as the brand claims. 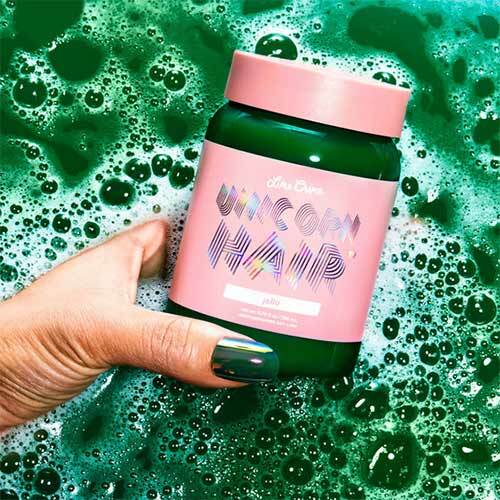 Manic Panic is another brand that sells cruelty-free, vegan products. 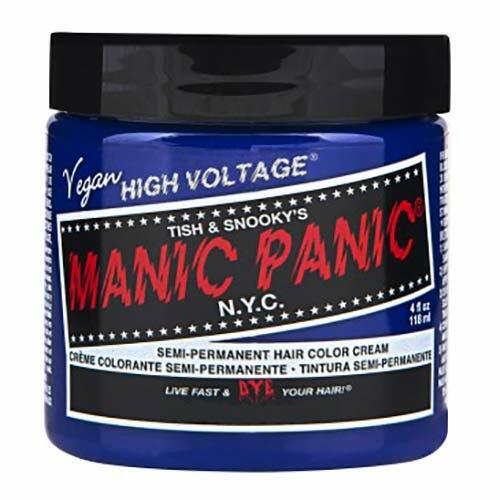 Being one of the most popular brands for bold unnaturals, Manic Panic delivers excellent hair color results. The colors also help condition your hair while staining it with color. It does not contain harmful chemicals like PPD, ammonia, or peroxide. Electric Lizard, Enchanted Forest, Green Envy, and Venus Envy. A trusted brand for bold unnaturals. Has a large variety of colors. Colors are vibrant and extremely pigmented. Pravana’s Chromasilk Vivids are among the most vibrant hair colors out there. Used by professionals as well as beginners, the colors are extremely vivid and a little bit goes a long way. The salon quality dye lasts for 4 weeks and fades to beautiful pastel shades. A little goes a long way. You need to add conditioner to your dye. 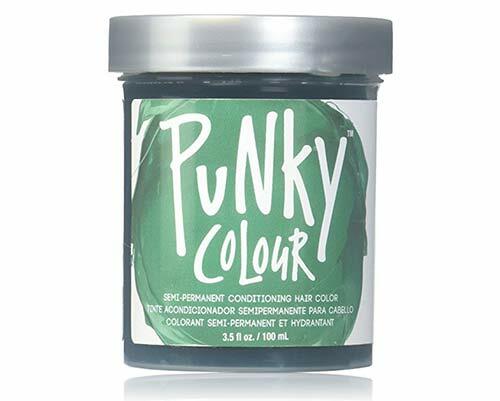 Created by a hair color expert, Jerome Russell’s Punky Color contains ingredients of the highest quality. The brand claims to have dyes that do not bleed and all the products are completely cruelty-free. The dyes not only color your hair but also leave your locks feeling super hydrated. Alpine Green, Apple Green, and Spring Green. A little goes a long way, especially when diluted with conditioned. Color stays vibrant for 3-4 weeks. As opposed to the claims made by the brand, some of the dyes do stain your skin, sink, and shower. 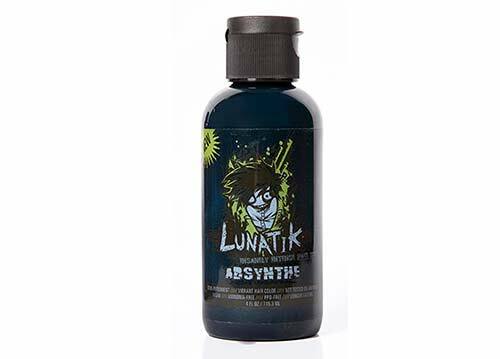 Lunatik Hair Dye claims to be one of the superior and longer lasting hair dyes. The products are vegan and cruelty-free and do not contain harmful ingredients such as PPD. The dyes are specially formulated for the alternative culture community. Fades beautifully while staying bright and vibrant. Color stays vibrant for 4-8 weeks. 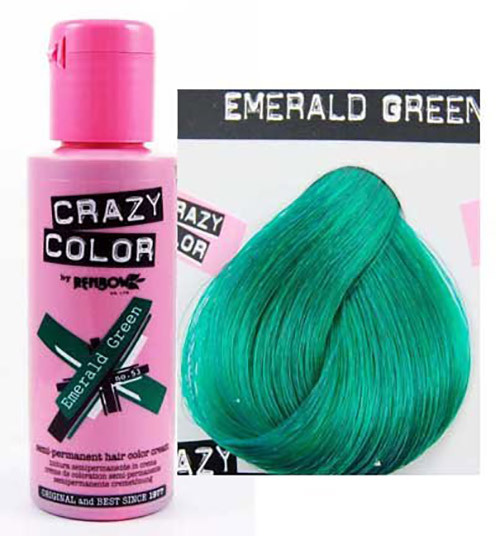 Renbow’s Crazy Color is an extremely popular dye in the UK. Launched in 1977, Crazy Color is one of the oldest brands that sell bold unnatural colors. The range has a large spectrum of colors to choose from, including multiple shades of green. Pine Green, Lime Twist, and Emerald Green. Stargazer’s Semi-Permanent Hair Colors come with added conditioner, making the dyes the perfect hydrating direct color treatment. Free of harmful chemicals such as ammonia or peroxide, the dyes do not damage your hair. African Green, Tropical Green, and UV Green. Vibrant and extremely pigmented dyes. Fades beautifully to pastel shades. Some shades only take to extremely light hair. Bleeds a little during and after each shower. 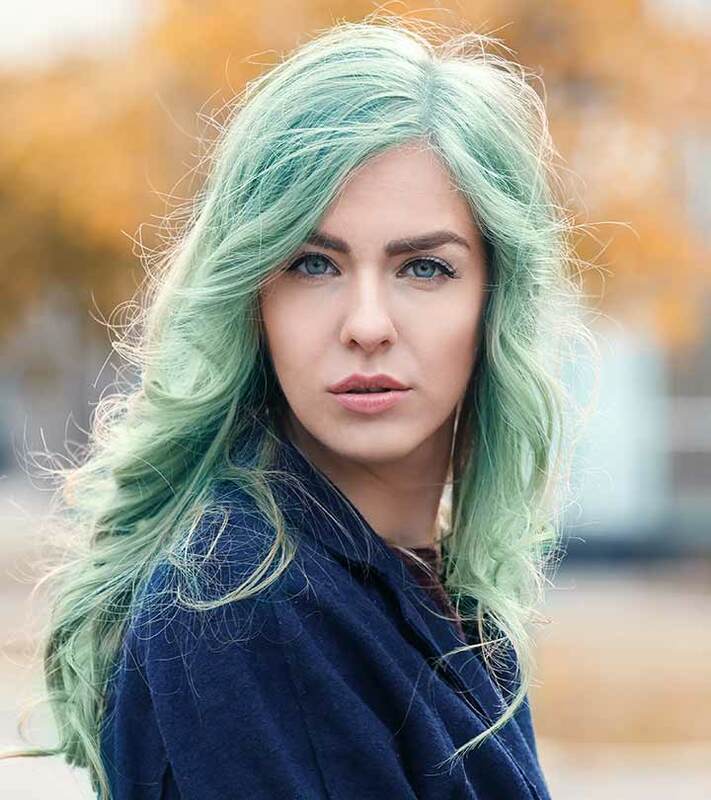 If this list won’t get you inspired to dye your hair green, I don’t know what will. 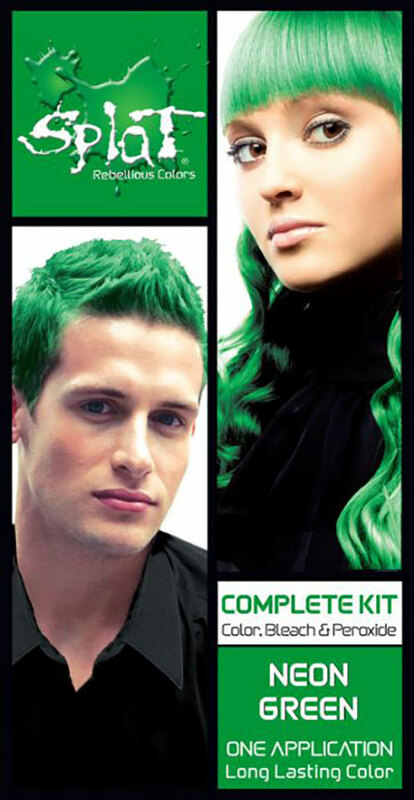 What is your favorite shade of green and what do you have in store for your hair? Let us know in the comments section below.